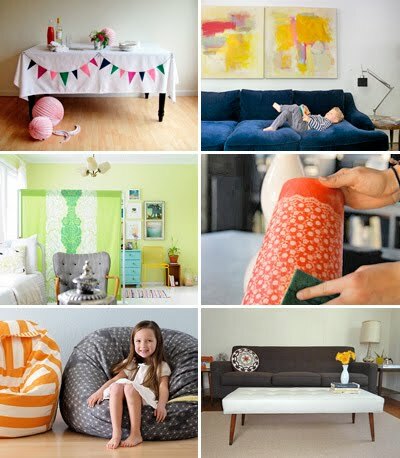 Here's a small round-up of goodies to make for your house. On your lunch hour, really, since a mid-century bench shouldn't take more than ten minutes to whip up. Ha. Have fun making! The bunting tablecloth is adorable! Thanks for sharing. I've been reading your blog for over a year now and have never commented... Shame on me. I just wanted to let you know that your blog is one of my faves!! Thanks for all the freebies and tutorials that you post. I am definitely going to make the mid-century modern bench! Also, I love your fabric line! Inkodye looks like a fun, less messy way to try batik. Just curious if you've road-tested it yet? Whoa. Off to checkout the beanbag chair. I have a ton of fabric scraps I could stuff it with. that tablecloth is so pretty!! Can't wait to try it! Really this is very nice collection..i like this..Thanks for all the freebies and tutorials that you post. So I'd never heard of Inkodye, but now I am completely intrigued! I think even my 3 year old would love to make a project with it and see the colors develop. Wow. So cool! The DIY table is so cool! I needed to stop by & tell you how much I love checking your blog! Although I don't really have a lot of orange items - I do derive "energy" from seeing the "color of one of my fave fruits" used in all sorts of design. Thanks for continuing to search the web & post the freebies, tutorials and time-wasters!! so cute...loving the bean bags! !